The contemporary Israeli experience does not necessarily center around Tel Aviv. Kobi Oz exposes a different Israeli ethnic identity, an Eastern-Tunisian identity that thrives outside the large urban areas, in the cities and development towns in the southern part of the country. The plot of the original novel, written for young adults, unfolds like a family album, each character reciting his own monologue, rock-opera style. The hero is Moshe Chuwato, a young soldier, sad and pensive, busy making plans for a fun-filled vacation from the army. He finds time to participate in the mourning ceremony for his uncle Charlie, a sensitive oud player who never assimilated into the local Israeli cultural scene. He manages to sleep with Zila, but looses her to Micha, the successful and ambitious DJ. Moshe's mother, proud of her son's Eastern identity, spends her time cooking and baking Tunisian delicacies. Moshe's father, head of the municipal sewage department and obsessive about cleanliness, is angry with his passive son who does nothing to get ahead in life. Oz's characters, concerned with questions of identity, falter between an authentic-Eastern and a modern-Western identity. For example, Moshe's brother, the ultimate Israeli hero, died during his military service, while Uncle Charlie's son has totally rejected anything to do with his Eastern heritage, and has become a well-dressed big-city lawyer. An aesthetic raven hovers above this family drama, bringing his hungry fledglings glittering jewels instead of food, but eventually he learns to care properly for his offspring. Moshe elects to give up. "My life is lost," he says out loud, seeking comfort in a cigarette. 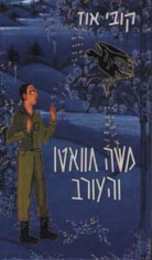 Kobi Oz received the 1997 Literary Figure of the Year Award for this book, awarded jointly by the newspaper Yedioth Ahronoth and Israel TV Channel 2. One of the most interesting and original books in Israeli literature in recent years.